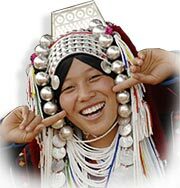 Hill Tribe silver beads, pendants, charms, clasps, earrings and jewelry components - direct from Chiang Mai, Thailand - home to the famous Thai Karen silver crafters. * Purer than Sterling Silver. * Each piece is unique and hand made. * You are welcome to explore the treasures that can be yours ! Draw attention to your favorite precious stones with these radiant sun stamped silver flower caps. Let your heart-themed jewelry designs stand out with these hammered heart silver beads. Add a shimmering look to your silver designs with these beautiful silver rice beads. Antiqued oxidized & handcrafted Karen Hill Tribe flower print silver charm. Perhaps these nuggets of silver are what you need to add luxury your jewelry making projects. Secure your bracelet & necklace designs with this versatile and complimentary handmade silver toggle.